We spend a large part of every year in Asia and have personally selected every item that we sell. Our particular interest is in Tibet and things Tibetan and we will stand behind the authenticity of everything that we sell. PHA BIANG CLOTH This handwoven pa biang is woven in a supplementary weft pattern & is a meditative cloth a mix of cotton & silk, most likely from the area of Sam Neua. 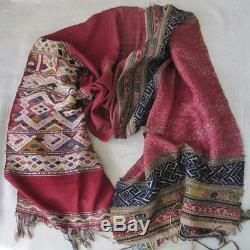 I bought this in the 90s, in Luang Prabang, Laos. It is 16" across, 60" long. It has been well used & has repairs in a number of places but the actual weaving is lovely. For more information plus the latest on travelling in Tibet, please visit our About Me. The item "ANTIQUE TAI DAENG PA BIANG MEDITATIVE CLOTH SILK COTTON HANDWOVEN LAOS" is in sale since Tuesday, September 26, 2017. This item is in the category "Antiques\Linens & Textiles (Pre-1930)\Fabric\Silk". The seller is "potalaworld" and is located in Petersburg, New York. This item can be shipped worldwide.